Almost every passionate, ornamental gardener has a dream destination file; a box, drawer or folder filled with clipped photos, articles and maps of exotic landscapes waiting to be explored. For as long as I can remember, I’ve been caching field notes to the Zen Gardens of Kyoto, Japan. From Ryoan-Ji’s world renown Dry Garden and Koto-in’s glorious maples to the famed Moss Garden of Saiho-ji and the Temple of Poets, Konpuku-Ji; there are so many ancient and alluring places to see, that I can hardly imagine where to start. But if we want to make our dream garden-tours reality, a plan is needed and a great guide book is a good place to begin. With travel planning in mind, I recently selected a copy of John Dougill’s Zen Gardens and Temples of Kyoto for review. 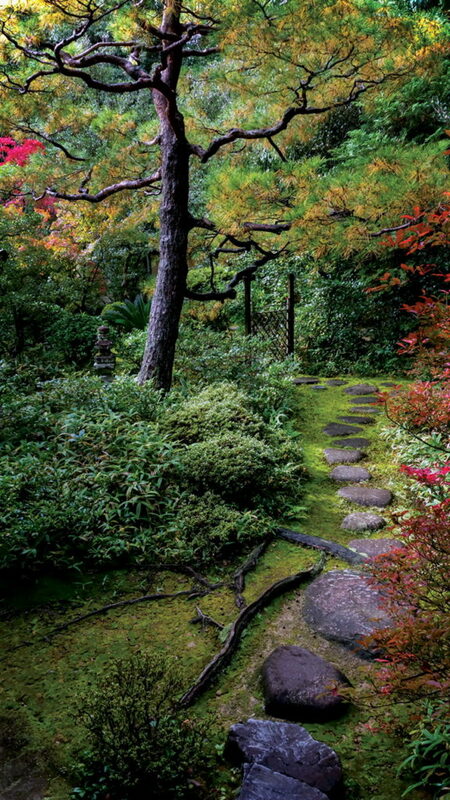 While I can not deny that John Einarsen’s gorgeous images drew me in and held me spellbound, I found Dougill’s detailed descriptions and the book’s format —with and introductory section devoted to Zen and Japanese culture, followed by a chronological listing of Kyoto’s Zen temples— has really helped me to prioritize my itinerary. My itinerary? Yes, I said that. The time has come. Now the clock is ticking and my date book is open. It’s time to get serious about this trip. I am particularly interested in Moss Gardens and Tea Gardens. The connection between these spaces and the Zen practice of traditional, Japanese Tea Ceremony is especially intriguing to me. 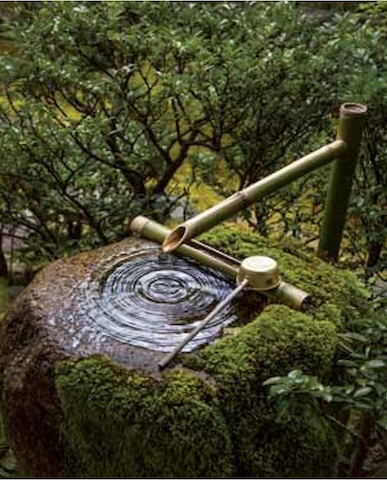 Moss-covered, stone basins, so often seen in Japan, inspired my Secret Garden’s water bowl. I find the hypnotic power of a shady, cool, reflective surface to be peaceful, calming and centering. Koto-In, famous for its Tea Gardens, Moss and Maples, is the first garden I flagged to visit. However, the author mentions that this place can be over-run with tourists in autumn. I love this kind of insight, as it helps me to consider when and how to see this special place without missing out on my reason for being there. I am also drawn to the suggestion of water in stone. With this in mind, dry gardens —such as Ryoan-Ji— are must-see stops on my list. I have waited a long time to make this extended trip and I want to thoroughly plan it, without destroying the spontaneity I love. Dougill thoughtfully mentions many of the little tips I like to know in advance when doing a lot of sightseeing; such as where to find a good restaurant. Where do your garden travel dreams take you? Do the Zen Gardens and Temples of Kyoto call your name? I am loving my hardcover copy of this guidebook, and plan to download the Kindle version for my iPad as well. I’m sure I’ll want Dougill’s valuable tips and advice in my backpack as I explore Kyoto’s treasure trove of ancient gardens. 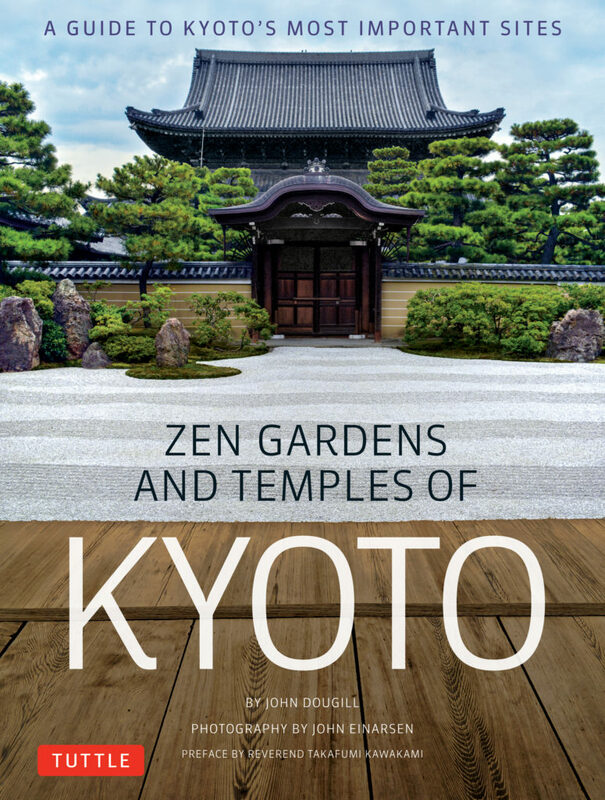 .At my request, a copy of Zen Gardens and Temples of Kyoto was provided by Tuttle Publishing for independent, honest review. No other compensation was received. All opinions are my own. Photography copyright John Einarsen, provided by and used with permission of Tuttle Publishing, all rights reserved. All other content on this site, (with noted exceptions), is the property of The Gardener’s Eden Online Journal and may not be used, reproduced or reposted elsewhere without written consent. You are currently browsing the Japan category at The Gardener's Eden.